Why not make your driveway a beautiful part of the landscaping? Concrete pavers, available in a wide variety of colors and shapes, can bring beauty, durability and functionality to the significant area that your driveway occupies. In addition, pavers can be removed and replaced unnoticed if you need to excavate under your driveway years later. The herringbone design is the strongest, interlocking pattern since it best stands up to both the horizontal and lateral forces of turning. It also handles the special demands associated with steep slopes. 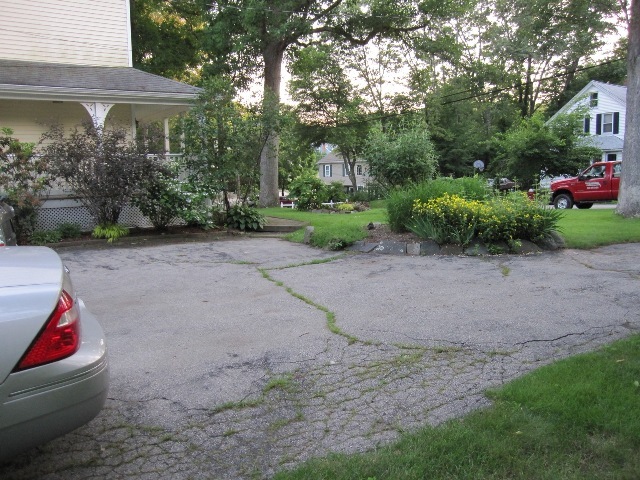 Long driveways often use the pavers close to the house, with asphalt filling in the remaining distance to the public road. In all cases, we design in granite cobblestones or granite edging to provide a durable transition between the asphalt and concrete pavers for the snowplows. 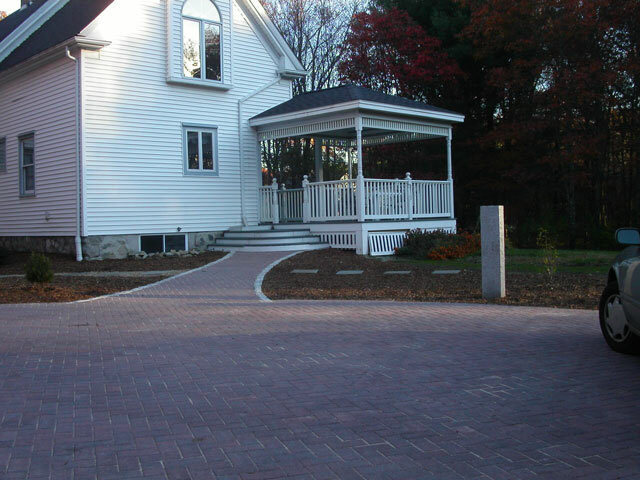 When planning your new driveway, consider incorporating "green" permeable paving technology. Permeable paving eliminates drainage issues plus minimizes oil and gasoline pollution of ground water. In winter, it eliminates puddles and refreezing, and may support faster snow melt. Permeable paving also offers a big advantage when a house sits lower than the street. Water will drain into the driveway and into the crushed stone reservoir below, eliminating the need for an unsightly drain grate in the driveway. If the home is susceptible to basement flooding, pipes can even be put in the reservoir to carry surplus water away from the house. Often the top of your driveway can become a beautiful and functional addition to your home's living area. The resulting courtyard is a beautiful sight from your windows and invaluable when you need additional space for a party. In these examples, we cut the driveway asphalt in a sweeping curve that blended with another landscape element like the walkway or garden edge. Next, we lined the cut with heavy granite cobblestones for snowplow protection and paved the resulting courtyard with pavers that complemented the desired look. This courtyard area is outlined with cobblestones and connects to a bluestone walkway. The paving is permeable. Pleasing curves, cobblestones and permeable courtyard add personality to this driveway. Curved bluestone walkways lead to courtyard decorated with a unique cobblestone flower, inspired by a motif from the architect H.H. Richardson. To protect garage from flooding, the downward sloping courtyard also contains a trench drain that runs 18' across, and drains underground to a 100' pipe leading to the back yard. The original driveway was too narrow and you could not open the car doors because they would hit the rock walls. Also, the walkway sloped too much for safe winter passage. 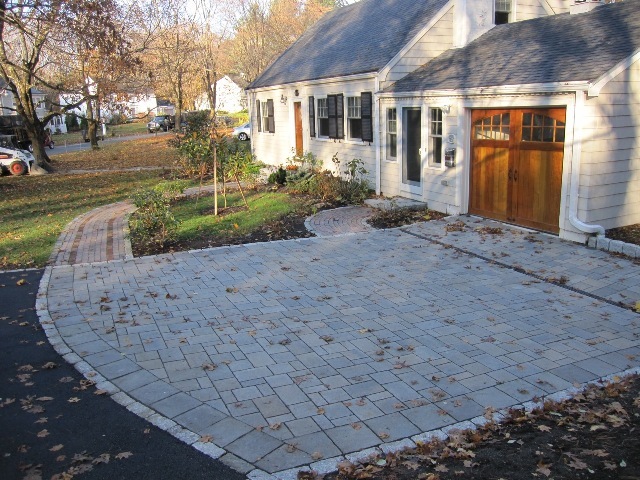 The new paver driveway is wider and used granite curbing plus a terraced rock wall to allow a car door to pass over. Granite steps in the walkway solve the slope problem. The end result is beautiful. Some walkways work best with the same paving as the driveway. A concave design for this walkway, lined with cobblestone, provided an ideal way to intersect the existing curving mahogany steps leading to the porch. Curving driveway lined with gardens and overlooking the lake provides a relaxed setting as you step out of your car. This driveway needed to pull away from the house, and integrate with a new front entrance. 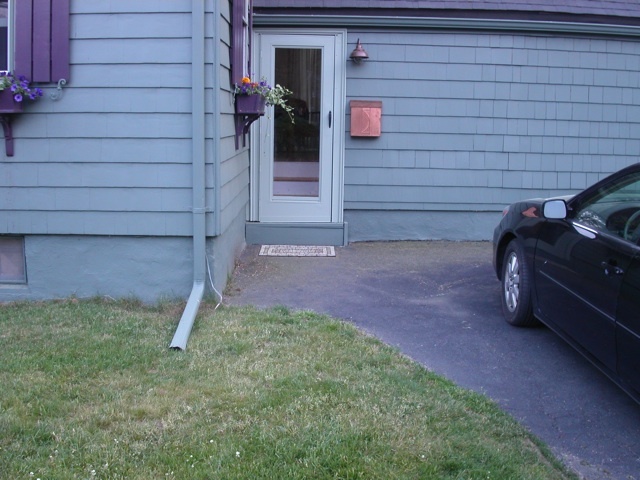 We redirected two downspouts which drained directly onto the driveway, and eliminated the steep banks on both sides of the house. The result? Greater symmetry and beauty. Granite entrances featuring the paver walkway and driveway greatly enhance this home. Jumbo cobblestones provide an attractive parking area. This curving, cobblestone courtyard connects three walkways but still allows occasional vehicular loads. Large granite hitching post protects driveway corner.